Note: At least two sources say that he also played for Burslem Port Vale before joining Argyle, but others suggest that this was not the case. 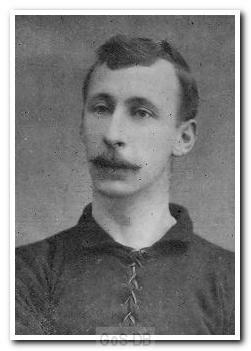 Jack began his playing career with his hometown side Alloa Athletic in 1891, and also represented Fifeshire, before spending six seasons with Bolton Wanderers. He made 110 appearances whilst at Burnden Park, scoring 29 goals from his position of outside-left and establishing himself as one of the fastest wingers in the country. A serious ankle injury ended his time at Bolton and in 1901 he signed for Preston North End. After a single season with The Lilywhites he had a similar stint at Glossop before becoming Argyle's first professional footballer in 1903. The Argyle handbook of 1904-05 describes him as "our famous flier, probably last season was the best in the player's history". After the departure of Frank Brettell in 1905 he became player-manager but left after just one season following a disagreement with the board. Moving to Southend United, again as player-manager, he played for four more seasons before he was persuaded to return to Argyle in 1910 to once again take the helm. He made one further appearance on the pitch but became a true club legend - undoubtedly the greatest of them all - after a further 28 years in charge. Jack's sons David and Rollo also played for Argyle.